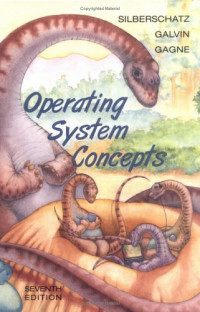 Small footprint operating systems, such as those driving the handheld devices that the baby dinosaurs are using on the cover, are just one of the cutting-edge applications you’ll find in Silberschatz, Galvin, and Gagne’s Operating System Concepts, Seventh Edition. By staying current, remaining relevant, and adapting to emerging course needs, this market-leading text has continued to define the operating systems course. This Seventh Edition not only presents the latest and most relevant systems, it also digs deeper to uncover those fundamental concepts that have remained constant throughout the evolution of today’s operation systems. With this strong conceptual foundation in place, students can more easily understand the details related to specific systems. Increased coverage of user perspective in Chapter 1. Increased coverage of OS design throughout. A new chapter on real-time and embedded systems (Chapter 19). A new chapter on multimedia (Chapter 20). Additional coverage of security and protection. Additional coverage of distributed programming. New exercises at the end of each chapter. New programming exercises and projects at the end of each chapter. New student-focused pedagogy and a new two-color design to enhance the learning process. Abraham Silberschatz is a Professor of Computer Science at Yale university. Prior to joining Yale, he was the Vice President of t5he Information Sciences Research Center at Bell Laboratories, Murray Hill, New Jersey. Prior5 to that, he held a chaired professorship in the Department of Computer Sciences at the University of Texas at Austin. His research interest include operating systems, database systems, real-time systems storage systems, network management, and distributed systems. In addition to his academic and industrial positions, Professor Silberschatz served as a member of the Biodiversity and Ecosystems Panel on President Clinton's Committee of Advisors on Science and Technology, as an advisor for the National Science Foundation, and as a consultant for several private industry companies. Professor Silberschatz is an ACM Fellow and an IEEE Fellow. He received the 2002 IEEE Taylor L. Booth Education Award the 1998 ACM Karl V. Karlstrom Outstanding Educator Award, the 1997 ACM SIGMOD Contribution Award, and the IEEE Computer Society Outstanding Paper award for the article "Capability Manager", which appeared in the IEEE Transactions on Software Engineering. His writings have appeared in numerous ACM and IEEE publications and other professional conferences and journals. He is a coauthor of the textbook Database System Concepts. Greg Gagne is chair of the Division of Computer Science and Mathematics at Westminster College in Salt Lake City where he has been teaching since 1990. In addition to teaching operating systems, he also teaches computer networks, distributed systems, object-oriented programming, and data structures. He also provides workshops to computer science educators and industry professionals. Professor Gagne's current research interests include next-generation operating systems and distributed computing. Peter Baer Galvin is the chief technologist for Corporate Technologies (www.cptech.com). Before that, Peter was the systems manager for Brown University's Computer Science Department. He is also contributing editor for SysAdmin magazine. Mr. Galvin has written articles for Byte and other magazines, and previously wrote the security column and systems administration column for ITWORLD. As a consultant and trainer, Peter has given talks and taught tutorials on security and system administration worldwide. When it comes to uncovering your Mac's hidden powers, there's no better resource than MacOSXHints.com, a collaborative Web site that lets Mac users share their favorite tips and tricks.